Arithmetic rules is the basic topic required for primary level students. While using arithmetic operations like addition, subtraction, multiplication and division we need to follow these arithmetic rules. Without knowing these rules we cannot evaluate arithmetic expressions correctly. whenever we have a numerical expression like -5 + 6 -7, we may have a confusion that we need to add those numbers or subtract? That time we have to remember the rule given below. Whenever we want to multiply or divide two numbers, we must follow the rule given below. By multiplying 15 and 4 we get 60. The signs of two numbers are negative and positive. By multiplying + and - we get negative. That's why we put negative sign for the answer. 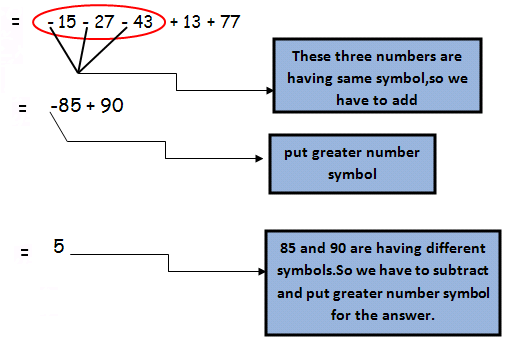 Likewise let us consider 5a, here the number 5 and the variable a are multiplying. Since there we don't have any sign in the middle of 5 and a we have to consider that there is multiplication. Now let us see mixed problems based on the above concept. Since the given numbers are having same signs, we have to add them and put the greater number sign. Since the given numbers are having different signs, we have to subtract them and put the greater number sign. After having gone through the stuff given above, we hope that the students would have understood "Arithmetic rules". Apart from the stuff "Arithmetic rules" given in this section, if you need any other stuff in math, please use our google custom search here.